Top level menu items are the items that are always visible in your menu bar. The display of top level menu items cannot be changed, so this setting will have no effect on them. Header items are the items that appear at the top of a submenu column. Generally, they are bolder or larger to set them apart and define the group that they head. 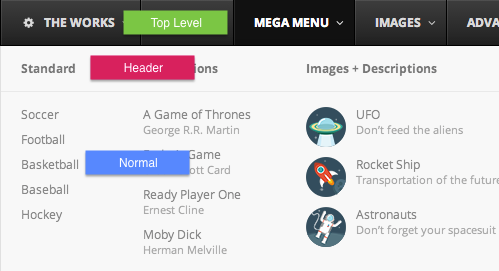 When left on Automatic, second level menu items will become Header Items automatically. This setting allows you to override that. Normal menu items are the items that comprise the content of a column in the submenu. Generally, they are just basic links stacked vertically. When left on Automatic, third level menu items and deeper will become Normal Items automatically. For your standard mega menu layout, you generally don’t need to adjust this setting (just leave it on Automatic). 1. Turn a Header item into a Normal item, in the case where you don’t want column headers in your submenus. 2. Turn a Normal item into a Header item, when you are creating column headers deeper inside the menu.